This weekend, I shared my first Amazon Haul via stories. 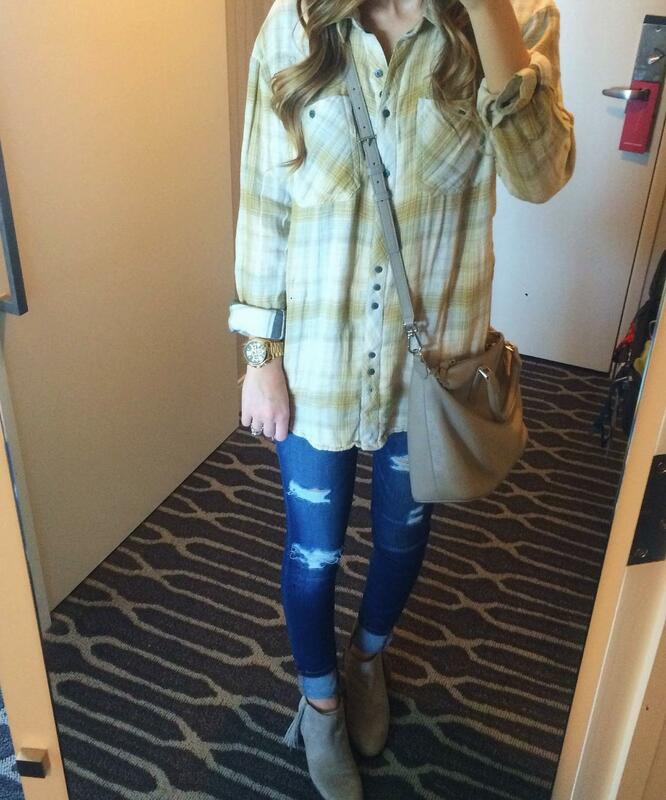 This was a highly requested try on…who knew Amazon had so many amazing pieces?! All of them Amazon items I am sharing below are under $35. 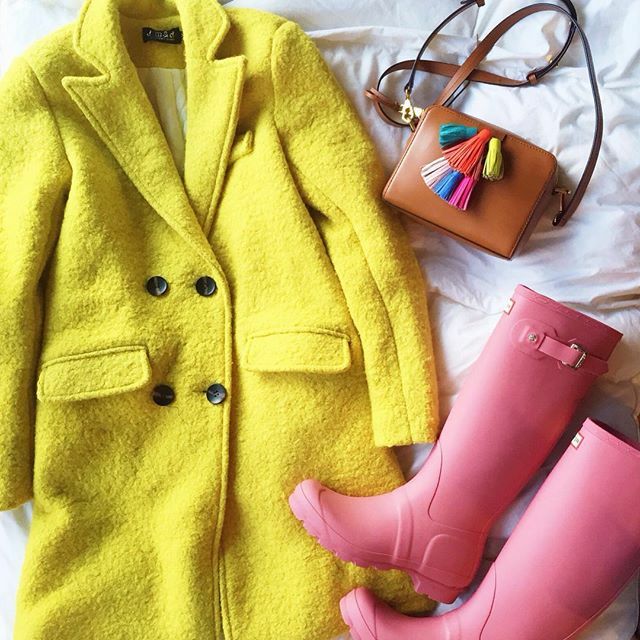 Most of these pieces are closet staples and can be worn year round. Stay tuned for another Amazon Haul coming your way soon! In the meantime, check out the try on haul on my stories if you missed it! It’s saved under TRY ONS. 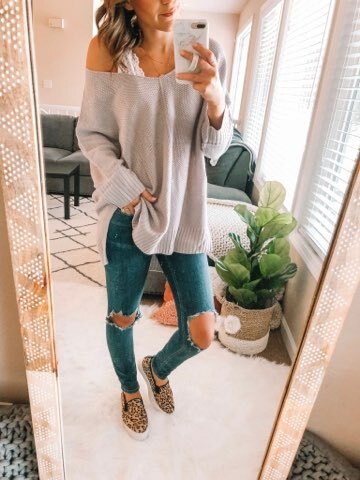 Sweater (Size: Small // Color: Lilac Grey // Price: $26): This sweater is perfectly oversized and one you will want to wear year round! It does run big, I am wearing a size small. 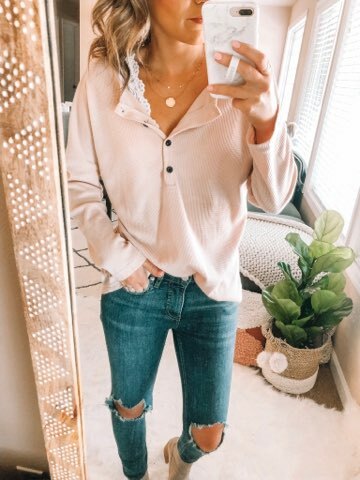 This cutie looks great on or off the shoulder and is the perfect weight to wear into spring and summer! Lace Bralette (Size: Small // Color: White // Price:$12.50): I love a good bralette and this one is such a steal! At under $13, this piece is high quality and feels like it should be more expensive than it is. The lace on this bralette is SO pretty. I love that it has thicker straps too, making for the prettiest pop peeking underneath my tops. The cups are padded, which was a nice surprise as many of my bralettes are not. 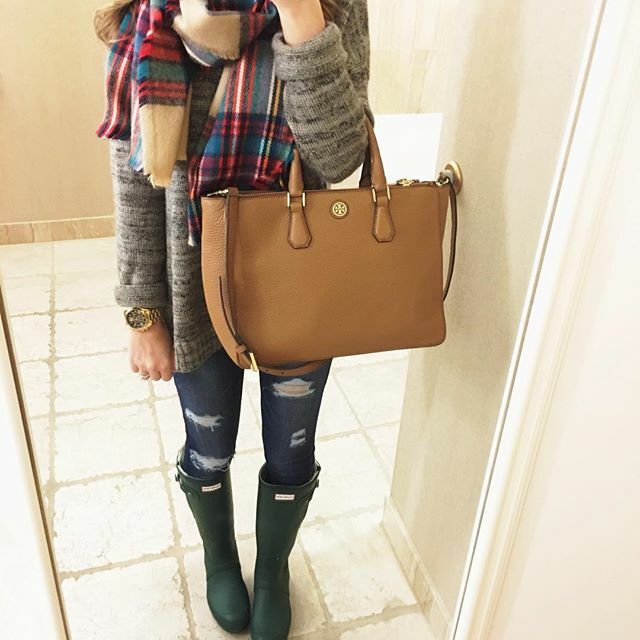 This one comes in a bunch of colors and I will definitely be picking it up in a few more! Button Henley (Size: Small // Color: Beige // Size: $25): I bought a few henley’s (see below), but this one was by far my favorite. 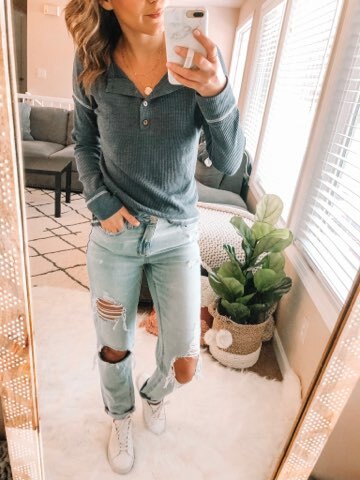 I love the relaxed fit and that it’s a bit oversized. I ordered the beige color, but it definitely has a blush undertone which I LOVE! 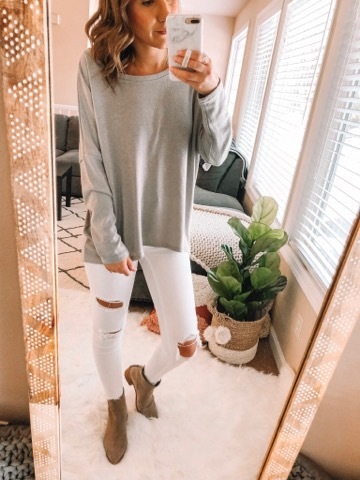 Off the Shoulder Sweater (Size: S/M // Color: Khaki // Price: $27): This off the shoulder sweater is very oversized. I’m wearing the smallest size and it’s definitely on the larger side. 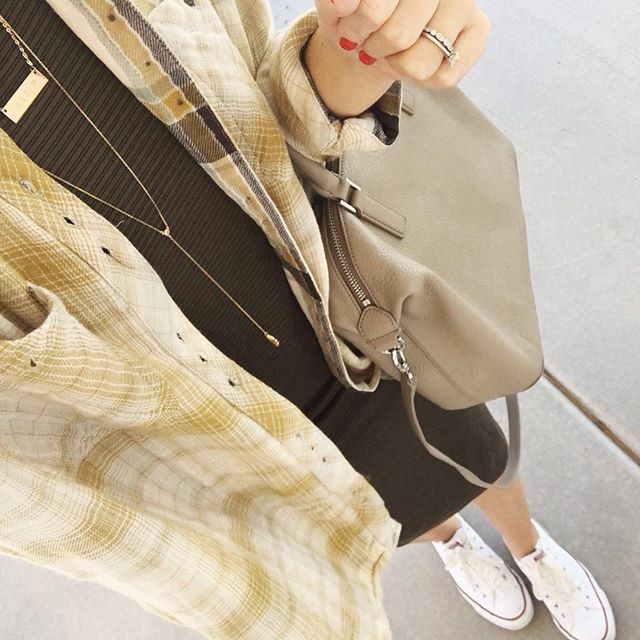 However, I don’t mind and really love the oversized, slouchy fit! This is one that can be worn untucked or tucked in. 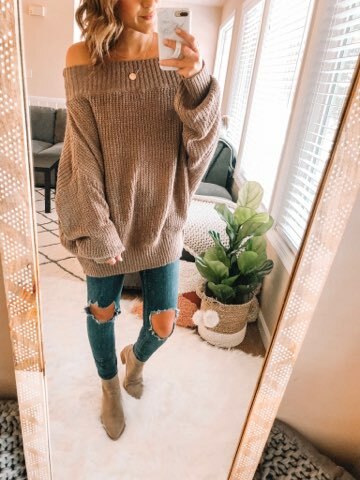 If you are on the shorter side, this might even be worn as an off the shoulder sweater dress and would be so cute paired with OTK boots! Henley Top (Size: Small // Color: Navy // Price: $20): This is the other henley top I mentioned that I bought. I ended up ordering this one in a few colors and really love the fit and length. This is another piece that comes in a ton of color options and you really can’t beat the $20 price tag! I’m wearing a small, but suggest sizing up if you want a looser, more oversized fit! Contrast Color Quarter Zip Fleece (Size: Small // Color: Light Grey // Price: $28): Hands down my FAVORITE Amazon purchase! I’ve had this fleece pullover since last year and it’s one of my most worn pieces. 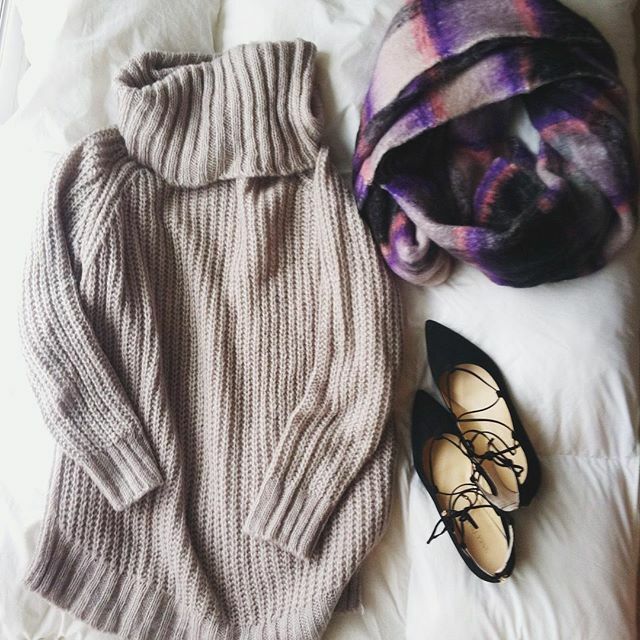 I reach for this cozy piece frequently, especially after a long day of work. I love the contrasting colors and that it’s fuzzy on the inside and out. Casual Pullover Sweatshirt (Size: Small // Color: Dark Grey // Price: $24): A great crewneck pullover is a closet staple. 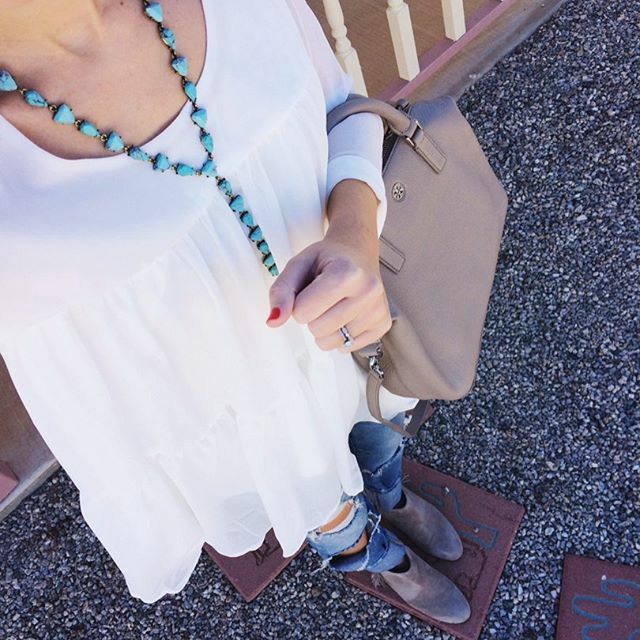 This one is under $25 and is so easy to throw on! The split hem adds a flattering touch and the longer length is great for paring with leggings! 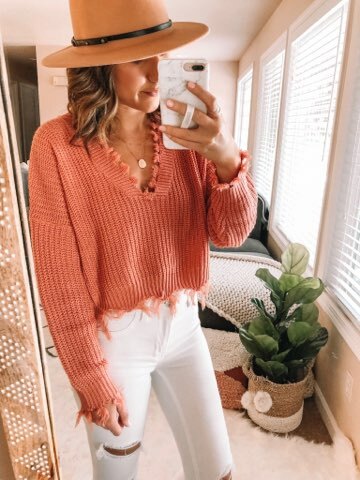 Distressed Sweater (Size: One Size // Color: Orange Pink // Price: $23): I know not everyone is a fan of this distressed sweater look, but I adore this one! The color is gorgeous for spring and summer and the distressed hem adds a fun touch. 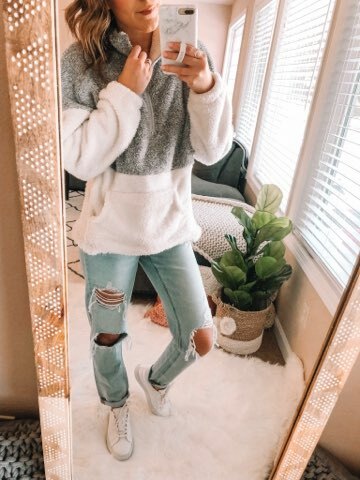 This sweater is quite a bit cropped, but pairs perfectly with high waisted bottoms. I can’t wait to wear this one in the summer with shorts! If you are not a fan of the cropped look, this is one you might want to skip out on! Hat (Color: Camel // Price: $18): I’ve had this hat for awhile and completely forgot about it until recently. I’ve been wearing it so much lately! It’s under $18 and such a steal! Mine came with two bands, that can easily be changed out. 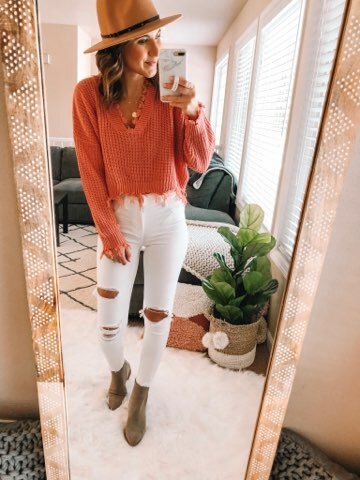 It comes in a ton of colors and is the perfect piece to top off any outfit! 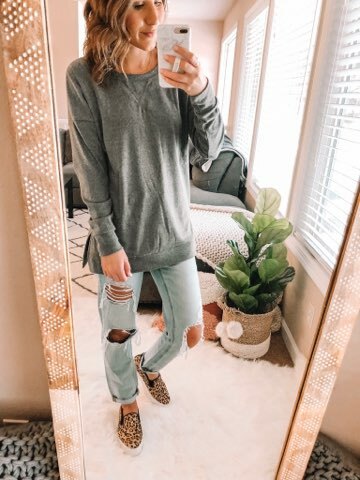 Long Sleeve Tee (Size: S 2-4 // Color: Gray // Price: $18): This long sleeve top fits even cuter than the photos! This is the gray option and I love the color! Online it looks slightly more green than it is, so please note that the gray color is actually a pretty dove gray. This top is longer in the back. 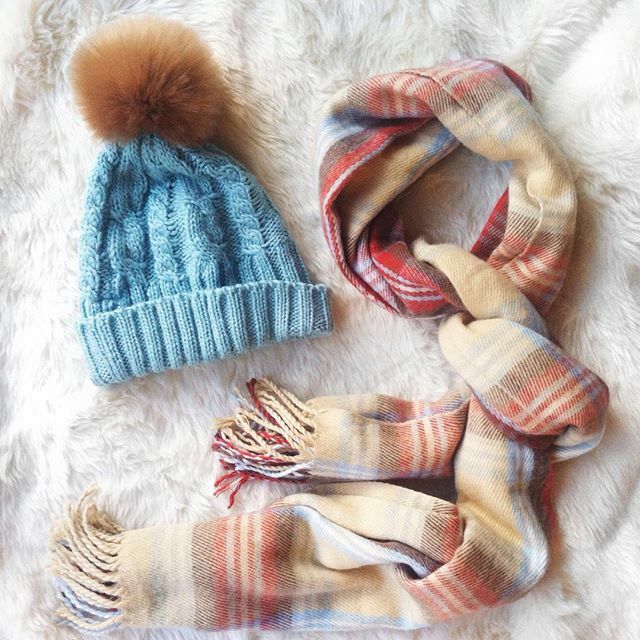 It’s a closet staple that can be worn from season to season! Leopard One Piece Swimsuit (Size: Small // Price: $30): If you’ve followed me for awhile, you know I am a sucker for a cute suit! Even though it’s still FREEZING here, I’ve already picked up a few for the summer, and surprise, surprise, majority of them are leopard print. This suit is only $30 and I am obsessed! It comes with padding and the fit is pretty great. Moderate back coverage and really cute side cutouts. Cover Up (Color: Off White // Price: $19): I can’t get over this cover up! It is SO CUTE! The under $20 price tag makes this cutie such a steal! My one complaint is the sizing, as it is a one size piece. I love the pretty crochet detailing and that a bit of suit peeks through. In honor of Mother’s Day this weekend, I am so excited to get to introduce you to MY mom! I had so much fun shooting this post with her as she is usually behind the scenes! This woman is amazing and inspires me every day. 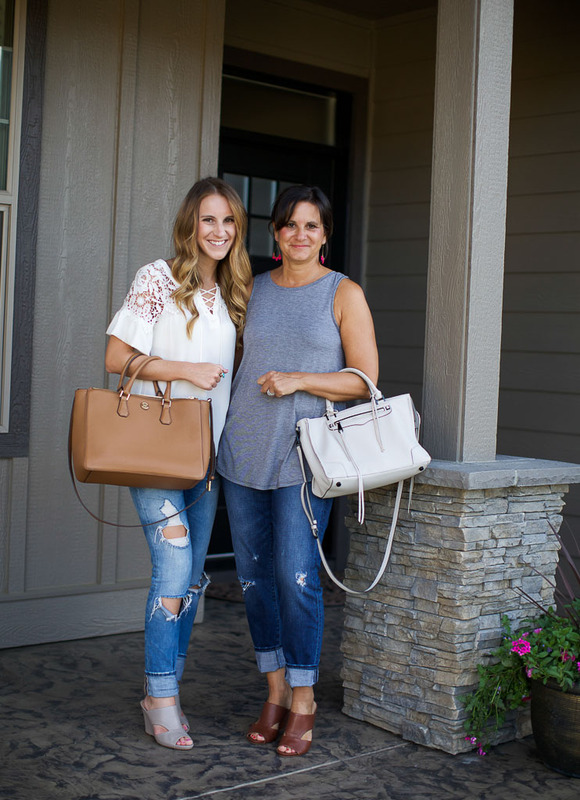 She is truly my best friend and I love spending time with her, whether it’s shopping, or sitting on the couch (I also love sharing accessories and shoes…is there anything better?). Mother’s Day has always been a special affair in my household! My whole family gets together to celebrate the wonderful women in our lives! We gather at a local park and spend the day eating good food, playing frisbee and volleyball and enjoying the sunshine and each others company! It’s something to look forward to every year! Naturalizer is declaring May 7th as “Walk Together Day.” A day to celebrate, honor and thank the important women in our lives! I am beyond excited to spend the day celebrating with the woman who inspires me most! 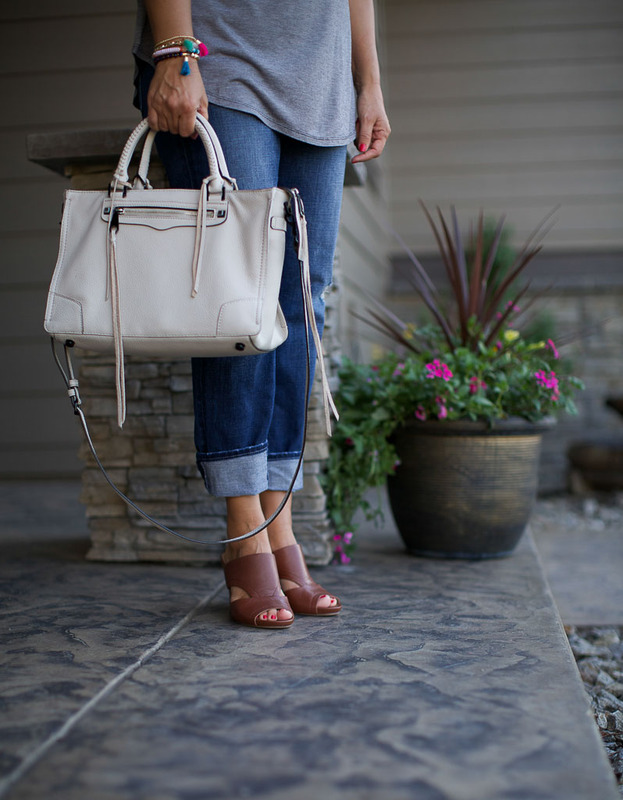 My mom and I had so much fun styling Naturalizer’s Bankston Wedges! This shoe is trendy yet classic. It has fun cutouts and a peep toe, but has a classic shape (you can never go wrong with a wedge) that can easily be dressed up or down. Our favorite! Everyone has a mother. Whether we call her mom, grandma, aunt, sister or simply friend, these women have helped shape our lives. They have always been there for us and walked by our side. So this Mother’s Day, Naturalizer wants to help celebrate these inspirational women by asking them to take a WALK TOGETHER. Whether it is a virtual walk down memory lane or an actual stroll outside, let’s share a moment and spend some time with that special woman who has always walked by our side! I encourage you to share your own special photos and moments using the #ShareTheWalk hashtag! Naturalizer is also letting you save together by offering 20% off and free shipping May 5-8th! 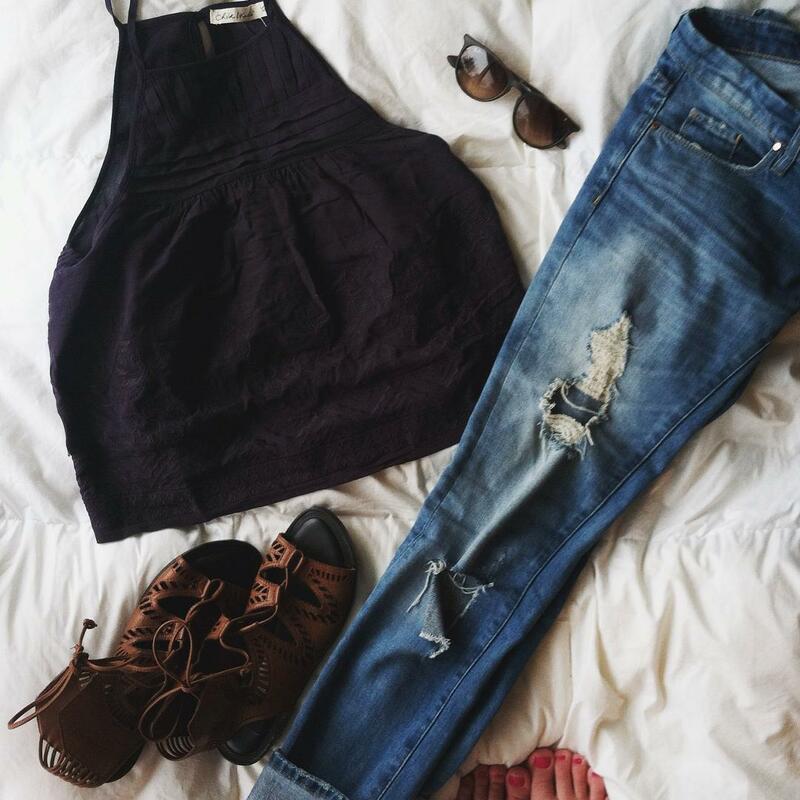 Thanks to Naturalizer for sponsoring this post!